~ In 1990 after seeing the movie "Crossroads" which features Sonny Terry on bluesharp I became aware of the beautiful and haunting sound of the harmonica. A couple of months later I saw the Blues Brothers play on a Saturday Night Live rerun on MTV. I was thinking if Dan Aykroyd can do it than I'm also gonna give it a go. If everything would be possible (waking the dead included), which bluesharp player would you invite for a jam session? 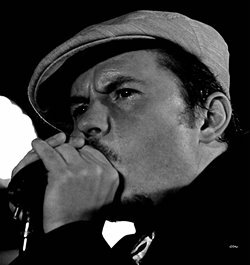 ~ I would invite Gary Primich because he's one of my all time favorites but if Noah Lewis, Paul Delay, Don les, William Clarke and a couple of other harmonica players would join in that would be amazing. 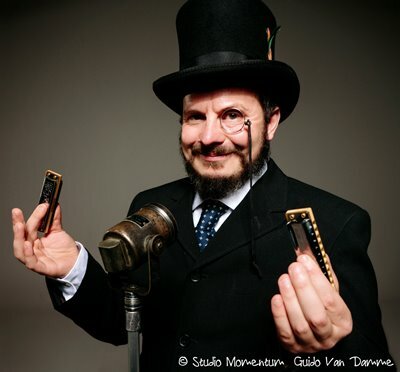 ~ The first harmonica I bought was a Hohner Special 20 and that's a model I've always liked and still sometimes use. Afterwards I have played on a lot different models from different brands because I was looking for the right match. The first time I played on a Marine Band Deluxe and later on a MB Crossover they both directly felt and sounded really great, it was like a match made in heaven. So since 2009 I've been playing the MB Crossover, that's a very versatile harmonica with a nice bamboo comb and great volume. ~ I use both because both techniques have their benefits and also their disadvantages. Using both is also what I would recommend. ~ Harmonica Blues (Yazoo Yazcd-1053) featuring some of the great pre war blues harmonicaplayers like Freeman Stowers, Gwen Foster, Deford Bailey and some others Blowing The Blues - A History of Blues Harmonica (1926 - 2002) is a great 3 disc compilation out on the Indigo label which featured alot of great players like Rhythm Willie, Big Walter, Little Walter, Junior Wells, Paul Butterfield etc. Muddy Waters - One More Mile (Chess). This is a Muddy compilation, spanning 1948 to '72. Contained are alternate takes, and obscure material, if not equaling/bettering Muddy's previous album cuts with some very nice accompaniment harpplaying by different harpers. ~ A Toothbrush, water and soap works well to remove debris from your harmonica. A couple of years ago I started using Kinya Pollard's method and bought myself a Ultrasonic cleaner. It's not really expensive and works very good. I clean my harps every 3 to 6 months, I know alot of players never clean there harps. ~ I don't give that many interviews. So I really don't know. ~ Kid Andersen' Greaseland studios in San Jose. Hard to describe if you have never been there. ~ When I started doing gigs (25 years ago) I was more nervous before going on stage but now I can feel a little tension before going on stage but that quickly disappears . ~ There have been more than a couple really memorable moments. Winning the "King of Swing" contest and afterwards joining the stage with Charlie Musslewhite, Billy Boy Arnold, Curtis Salgado, Mark Hummel, David Barrett and Sugar Ray Norcia was something I will never forget. Becoming a Hohner endorsee and also recording my "Nice 'N' Greasy" album at Greaseland Studios were very pleasant and memorable milestones. Their are also a lot of gigs I will never forget for different reasons.